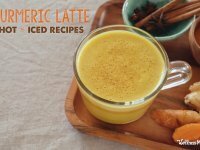 This delicious cinnamon turmeric latte includes collagen, cinnamon, turmeric, and black pepper along with healthy fat from the coconut oil. A rich and decadent drink that is nourishing as well as delicious. 1 cup brewed chicory root "coffee"
Heat water in the kettle. Let it get hot, but not boiling. Pour one cup of hot water into glass measuring cup. Add chicory tea bag* and let steep 3 minutes. Pour coconut milk into a small saucepan. Heat over medium heat. Add cinnamon and turmeric. Stir until incorporated and remove from heat. Add dash of black pepper to taste. Add the rest of the ingredients (except for chicory tea) and pulse with immersion blender until frothy. Pour chicory tea into mug and add milk mixture. Sweeten with honey if desired. Chicory is not recommended in large quantities during pregnancy. Please check with your healthcare provider before starting to drink chicory coffee if you are pregnant. To make an iced version: Omit the coconut oil and use cold chicory coffee or cold brew coffee and blend until smooth.